Insomnia. Welcome back to the quaint city of Derry, Maine. A place where ancient beings feed on children in the form of a clown, a place where the Crimson King reigns supreme, and for Ralph Roberts; a place where he can’t get any sleep. 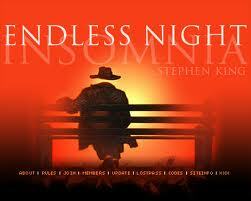 Ralph suffers from insomnia, and as his condition worsens he begins to see things that the waking world cannot. He begins to see auras, different planes of reality, and most frightening: he sees what he calls “the little bald doctors.” There are three of them; two of them are good which he names “Clotho” and “Lachesis.” They are the ones who have induced his insomnia to help them thwart the minions of The Crimson King. It is also their job to take people when they die.The third “doctor” is named “Atropos” and he is evil. He helps the Crimson King by taking people out earlier than when they are supposed to go. Ralph also sees that his girlfriend Lois also suffers from insomnia and together they try to stop The Crimson King’s influence over the people of Derry. He is trying to kill a young boy named Patrick Danville who is an apparent threat to The Crimson King taking down The Dark Tower. Ralph comes face to face with Atropos when he is trying to thwart him. Ralph overcomes him and then Atropos shows him a grim future for a neighbors daughter, Natalie Deepneau. Ralph then makes an arrangement Clotho and Lachesis to take his life instead of hers. Natalie’s father, Ed, falls under the influence of the Crimson King and tries to crash a light plane full of explosives into the Derry Civic Center during a Pro-Choice rally. This rally is attended by a young Patrick Danville, a gifted boy who stands between The Crimson King and the Dark Tower. According to prophecy, Danville cannot be killed by anyone that serves either “The Random” or “The Purpose,” which Deepneau is neither. Ralph defeats the Crimson King however, and causes Ed to crash the plane in the parking lot instead. Danville is saved and goes on to fulfill his purpose in The Dark Tower. The story ends with Ralph’s arrangement fulfilled when Natalie is almost hit by an oncoming car and Ralph pushes her out of the way and is killed. But at least, Ralph is able to rest now.